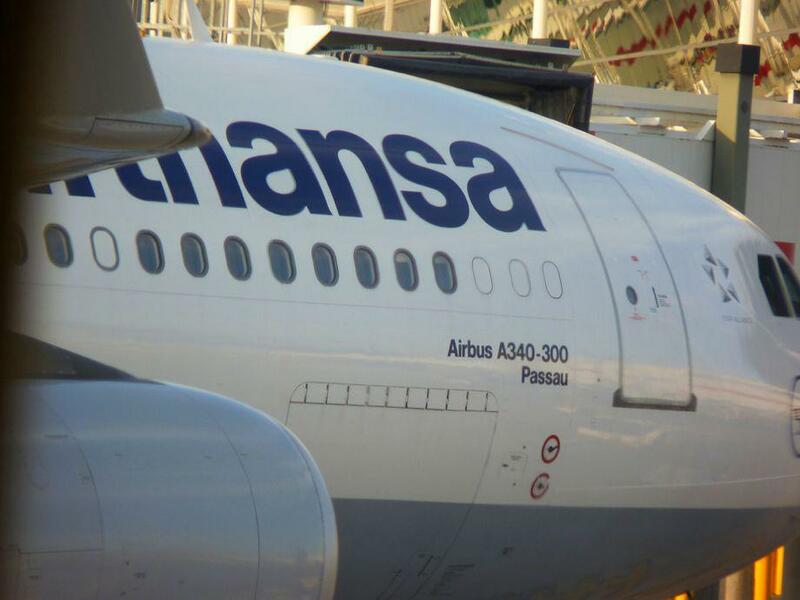 What's That Thing: What's that metal strip above the airplane door? What is that jauntily angled strip of metal above the airplane door? It’s a bird, it’s a plane, it’s … an air travel–themed, Thanksgiving double edition of What’s That Thing, Slate’s column examining mysterious or overlooked objects in our visual landscape. (If instead you’re traveling by car this Thanksgiving, click here, here, and here for roadworthy previous installments.) To submit suggestions and pics for future columns, email us. Flying home for Thanksgiving? If it feels like there must be 25 million other people doing the same thing, then you’re good with numbers: That’s the estimated number of travelers expected to get airborne around the holiday this year, a 1.5 percent increase over 2012. Busy skies also mean human gridlock on jet bridges from the terminal down to the aircraft door. While you’re waiting to board, you might have time to contemplate the purpose of the jauntily angled strip of metal above the door of most commercial aircraft. 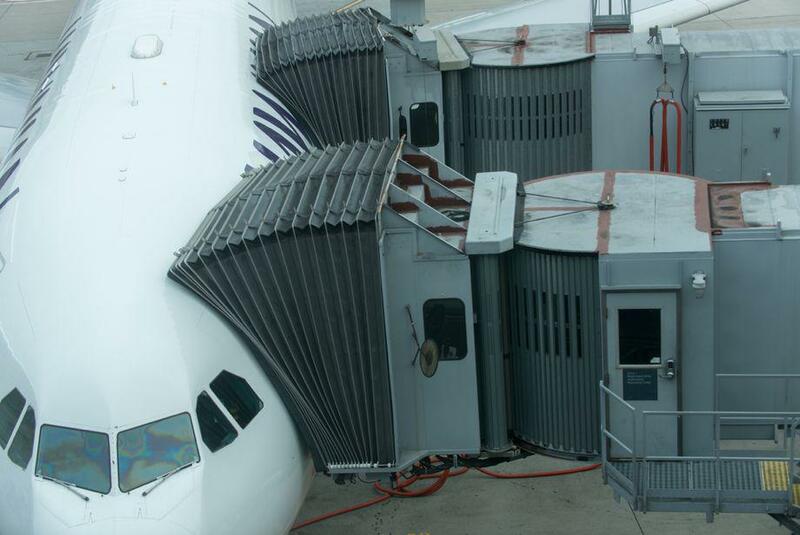 A close-up view of the angled metal strip above the airplane door. Form follows function, and on airplanes, function usually follows air; anything that messes with the airflow over the fuselage and wings had better be important. And that strip of metal looks pretty high-tech. But the strip is actually pretty low-tech. And its purpose has more to do with water than air. It’s a gutter, basically. It keeps passengers dry by channeling water to the side of the door while they’re boarding. It also keeps water out of the plane interior, where floors can become slippery. No one wants an upper fuselage’s worth of water dripping onto their head while they’re waiting for someone farther down the plane to decide just where they would or would not like to stow their hand luggage. The gutters are particularly important when passengers are boarding via steps, rather than a jet bridge. But even with a jet bridge in place, the seal between the bridge and an airplane’s fuselage isn’t always watertight. 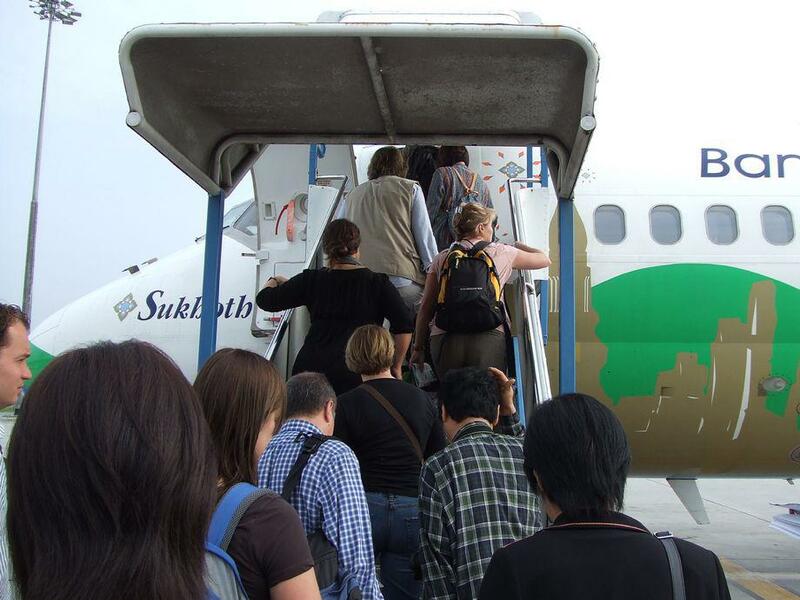 Rain gutters are especially important for passengers boarding an aircraft via steps. Our next object of curiosity is the little wheel attached to the jet bridge, down on the right side of the door in the picture below, resting against the fuselage. What’s it up to? What is the function of that little wheel just above the red barrier on the right side of this photo? Well here’s a hint. Let’s think about what happens when a plane arrives at a gate. The jet bridge is attached. Then, passengers get off. The cargo is unloaded. The trash is unloaded. Lots of things are unloaded. And then lots of things are loaded—passengers, bags, and lots of fuel. 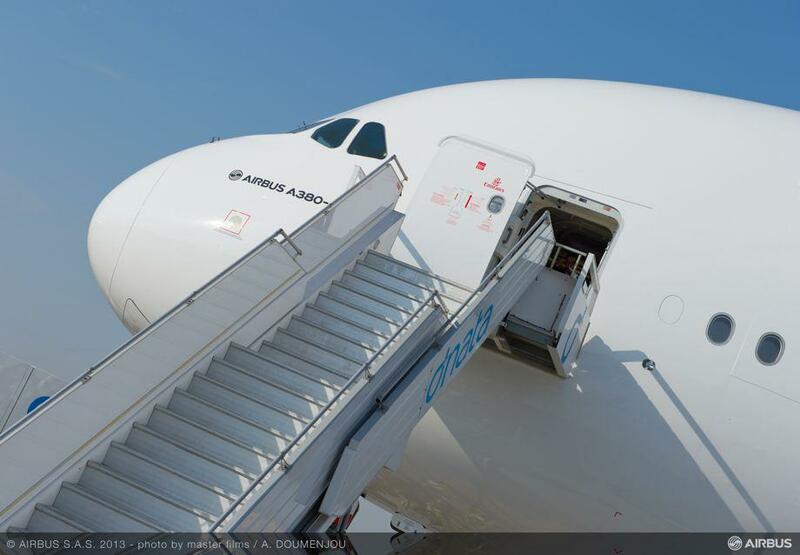 For the Airbus A380, the operating empty weight—that’s the weight of an aircraft before passengers, cargo and fuel are added, basically—might be around 610,000 pounds. After the aircraft is fully loaded, it could weigh around twice that much (1.27 million pounds is the maximum takeoff weight for an A380). Even for Thanksgiving, that’s some serious pound-packing. And all these changes in weight cause the plane to rise or fall slowly while it is parked at the gate. An Airbus A330-200 plane with two jet bridges attached. Why is it so important for the bridge to follow the aircraft up and down as it loses and gains weight? One reason is that a more-or-less level playing field makes it easier for passengers to get on or off without stepping or tripping. Wheelie bags do better too. 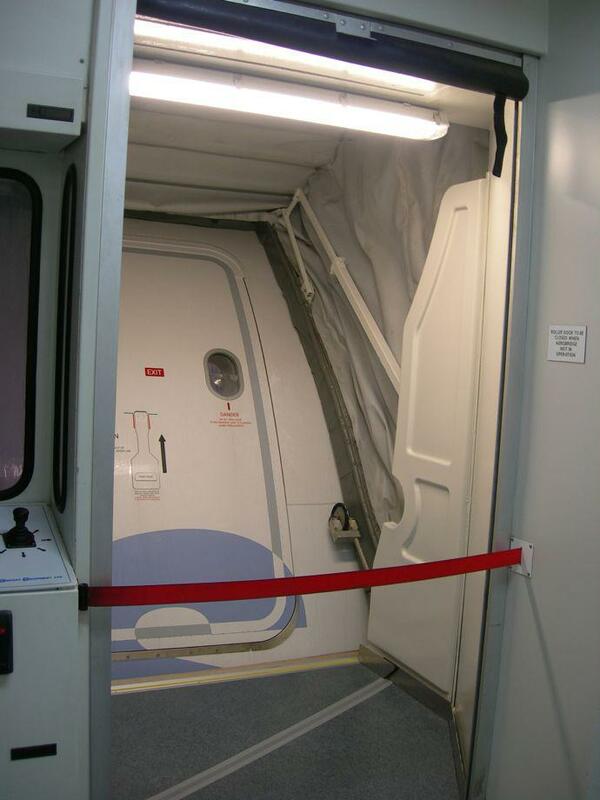 The biggest reason, though, is to avoid damage by the air bridge to the door of the aircraft. You can actually feel the autolevel function at work. Sometimes when you step from an aircraft onto a jet bridge, or when the passenger ahead of you on the bridge steps onto the aircraft, the autolevel kicks briefly into action. It feels like a little motorized jolt. This means that the bridge has sensed a change in the height—i.e., the weight—of the aircraft. It could be the fuel, or the cargo—or it could be you. Even with our national belt-loosening planned for Thursday evening, it’s probably not the case that these little jet bridge wheels get more of a workout after a big, food-centered holiday. But still, if you feel the jet bridge floor twitch briefly as you fly home next weekend, you might consider it a little outbreak of mechanical applause for your family’s cooking—and an opportunity to give thanks for the blessing of autoleveling technology. And while you’re still stuck on that jet bridge, ever wonder why no one has found a faster, simpler way to get passengers onto airplanes? Why does boarding have to take so long? Lots of people have wondered about this and there’s a veritable sub-discipline of airplane boarding optimization strategies out there. There’s the hallowed back-to-front traditional boarding, of course, with which most of us are familiar. But while back-to-front has the advantage of simplicity, it’s not speedy. Remarkably, it’s only slightly faster than boarding front-to-back. It would be faster just to board passengers at random, according to Jason Steffen, an astrophysicist. Steffen’s optimal solution would involve passengers boarding “10 at a time in every other row.” His model—based on a Markov chain Monte Carlo optimization algorithm, of course—assumes “that the time that a passenger requires to load his or her luggage is the dominant contribution to the time needed to completely fill the aircraft,” which will sound about right to many travelers this week. Then there’s the magic carpet idea—line up everyone in their aircraft-seat positions before they even get onto the aircraft. The magic carpet has the advantage of a good name, and the disadvantage of introducing travelers to their seatmates while there’s still time to ask to move. There’s also the proposed side-slip seat, which more than doubles the size of the aisle during boarding. And for really thinking outside of the, uh, tube, check out this patent for a removable aircraft cabin. That’s right—the cabin would detach from the aircraft. 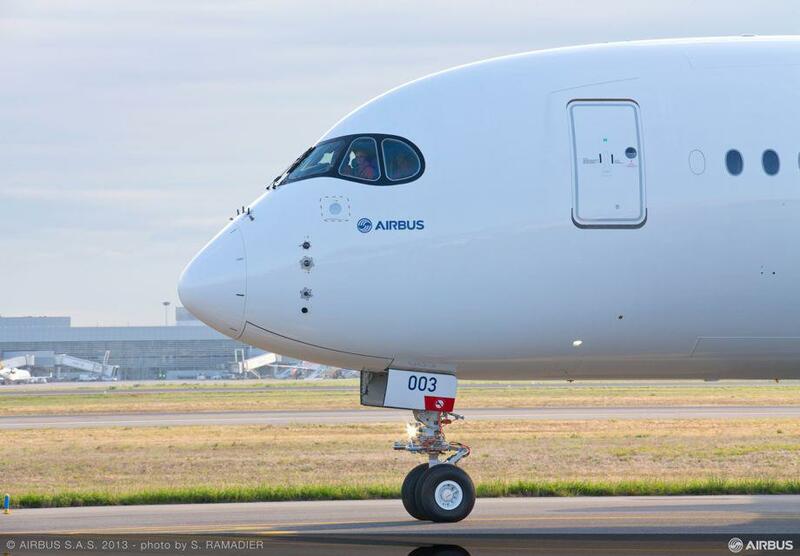 After passengers have boarded the “removable cabin module,” it would snap back onto the rest of the aircraft. See something up there over America this week, and wondering what it is? Airmail a pic and description to whatisthat@markvr.com.